The dragons of olde dream the dreams of times gone by. Of when their wings would spread wide to catch the air that would lift them on high. The armor plated scales of their chest still shone bright. Fore the fires that burned deep within heated those so hot that when their flames burst forth, they would light up the night sky, telling all that dragons ruled. Now the elders lay upon their horded treasures, which remind them of the days of olde. There are still dragons within the world today that are growing old as they fly among the mountain tops. They have no fear of man, but also have no place in the world of man. They are not needed to sway wars, or bring the wrath of gods down upon them, for man has learned to do that upon themselves. So now they fly high among the mountain tops, where man so seldom comes. They grow old in their own time as they find treasures to be hidden away for their day of dreams. Today there are so few young dragons born, who will play with the fairy of the wood. The need to keep them alive in this world of science is even more important now then ever before. So let me tell you of a woman that still knows how to make dragons live. 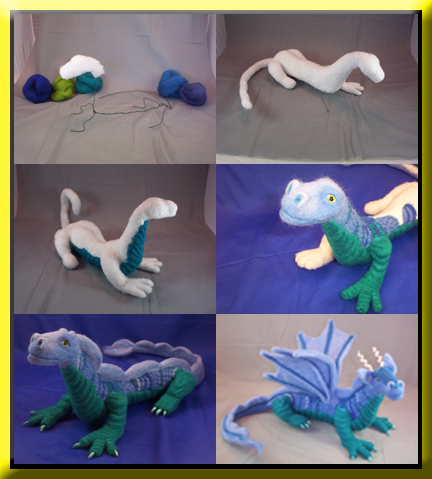 Her dragons and fairies start out as a craft that combines with others, only to excel to an art form of needle felted sculpturing. Though let us first go back for Felting is one of the oldest textile fabrics dating back to 6300 BC when dragons still roamed the world. 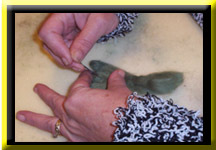 Wet felting is a combination of loose wool, water, detergent with motion and pressure. The use of needles to create the felt didn’t come about until the industrial era, when the need to remove water and detergent from the process became apparent. Then in the 1980’s it went another step from the two dimensional textile to a three dimensional art form. Through the use of a single or multiple hand controlled barbed needle a crafter could create wonderful things from loose fiber wool. Wall hangings, appliqués and patches are some of the popular uses for the process, but it is the three dimensional art form that has always caught my eye. The ability to mold the loose fibers with almost as much precision as one might mold clay amazes me. Yes, it takes that special eye to make a masterpiece, although some very beautiful pieces are made by people with very little natural ability also. There are instructions all over the internet for finding materials, and how to do wet felting and needle felting, so I will not go into depth in the particulars. The ability to find working needles have finally reached the different hobby, craft and fabric stores around the country. If they do not carry any near you, ask, or look on the internet for a small starter kit. All that is needed is a needle and colored wool. To save money a fiber fill for stuffed animals is available in all craft stores and works wonderfully for practice and finished pieces, and very inexpensive at the same time. Do not get me wrong needle felting is not for the feint at heart. The needles are very sharp and it is being thrust into a roll of loose material that rests between your fingers, so please be careful. One artist teases that she charges per needle prick instead of hours worked for the price of an object. Rarely does it draw blood, but the faint at heart need be very careful. With that said, if you take a look at the picture of assorted needle types and you will see that they are very sharp and can come in many shapes and styles. Select one that works for you and make sure it is comfortable. Everyone has their own technique and they vary slightly although most involve starting with a roll and punching the needle into it. By changing the angle and the depth and needle style different effects are created. With each thrust of the needle more fibers are captured and dragged deeper into the roll changing the surface and firming your roll. A firmly packed piece is preferred, although not an absolute necessity and not needed from the beginning. Get a feeling for the needle and concentrate on what you wish to create. With practice and learned technique almost anything is possible. A wired frame of florist wire is helpful for creating a base outline to follow, but again is not a necessity. It is only an outline for consistency to size. Remember that only one thing matters when creating any kind of craft. Practice improves your ability, and if it does not make you happy, it is not worth doing. 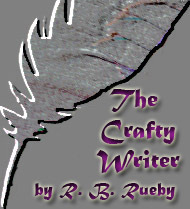 So enjoy your selected craft, or let someone else enjoy it and marvel at what they can create. When you see a crafter that has taken it to the next level and made an art form, remember the hours that must have been involved in the creation and a kind word is always appreciated. Patronage of a starving artist is also often appreciated, but I hope you will find your own craft and become the creator.